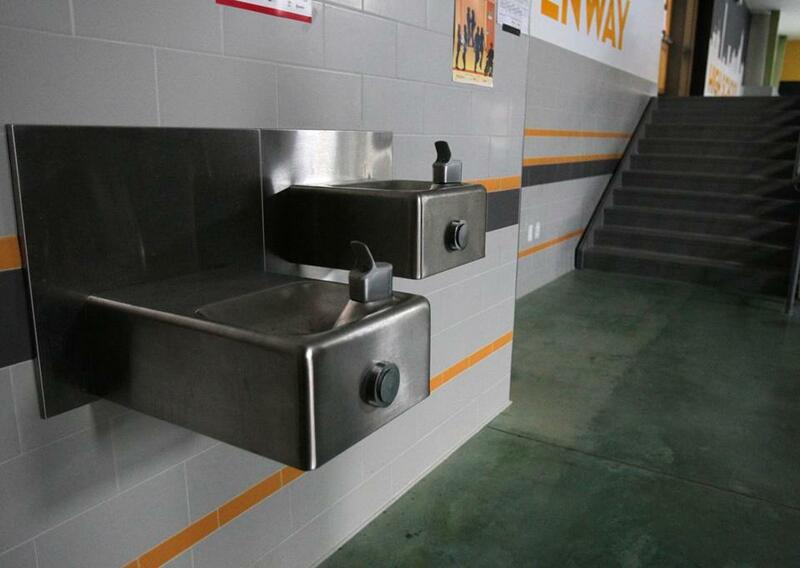 Water pipes were replaced and new water fountains were installed at the recently renovated Fenway High School. The Boston School Department has hit a snag in its efforts to restore tap water at school drinking fountains, after testing found high levels of harmful lead in the water coming from some newly installed fountains. School officials recently launched a $300,000 project to repair and upgrade plumbing so the fountain water could be restored at six buildings. But the fountains have not been used because of the worrisome tests. Officials are investigating the cause of the contamination and how to fix it. The officials have been hoping for substantial savings by turning fountains back on and dropping a costly reliance on bottled water. The district expects to spend $415,000 this school year to provide bottled water in two-thirds of schools citywide to keep children safe from lead in the water. The school district launched the first phase of a plan last year to repair old plumbing and to install new fountains and bottle-filling stations, starting with the Curley K-8 School, which has two buildings in Jamaica Plain; Boston Green Academy and Another Course to College housed together in Brighton; as well as the Lee K-8 School, Mather Elementary School, and the Trotter Innovation School, in Dorchester. The facilities were selected for the pilot program because prior tests indicated lead levels that were below state and federal standards, school officials said. However, testing conducted in recent months has shown elevated lead levels in the water bubbling up from some of the new fountains. Tests at five of the buildings have come back. At four of the buildings, at least one sample tested for lead levels above 15 parts per billion, the state standard. Elevated lead levels were found in nine of 36 samples taken at the schools. The district may end up spending more than the $300,000 it budgeted as it tries to fix whatever is causing the high lead levels, he said. The district continues to test lead levels in the tap water at the other 85 school buildings that are using bottled water, in the hope that eventually improvements will allow them to bring all of the drinking fountains back on line. But data from that testing shows that there’s good reason for fountains at those schools to be shut off. Elevated lead levels were found in 154 of the 639 samples taken at schools using bottled water since 2013. The School Department has seen success in restoring fountains for use in one school building. Fenway High School moved into a building after a major renovation that cost about $10 million. The project included replacing water pipes. School officials said that tests of the tap water there have shown acceptable lead levels. Children are particularly vulnerable when it comes to lead. Exposure has been linked to IQ deficits, shortened attention spans, behavioral problems, hearing damage, stunted growth, and lowered birth weight. The water flowing through water mains is virtually lead-free, officials say. Problems arise when the service line, which connects the main in the street to the building, is made of lead, or when there are lead-based components in a building’s plumbing, or when both issues exist. Older buildings are more likely to have lead issues. Most Boston schools were built before the 1950s. Restoring water for drinking at schools would be an expensive process in the short term, but in the long run it would be a significantly cheaper alternative than supplying bottled water, officials said. The process is expected to take years because the work can be time-consuming, disruptive, and because the department has limited funding. City Councilors Annissa Essaibi-George and Andrea Campbell called this week for a hearing about the district’s spending on bottled water. “Safe drinking water is essential to our children’s health and we continue to be committed to ensuring that students have access to clean water within all of our schools,” Walsh said in a statement.